David Browning, Sr. 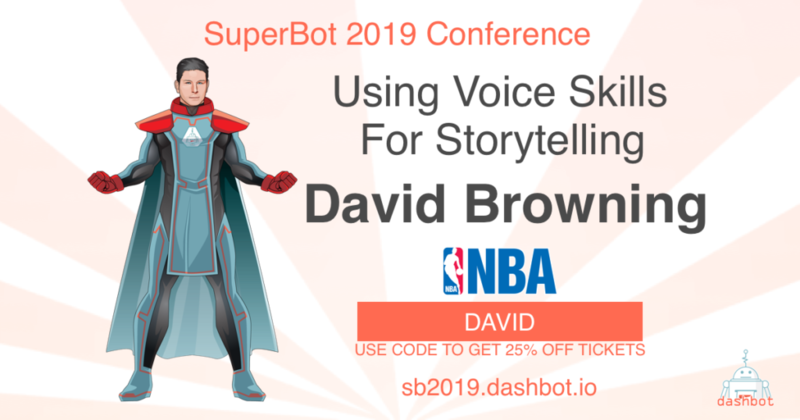 Product Manager for Emerging Products at Turner Sports, will be speaking at this year’s SuperBot about using voice tech in the sports world. David Browning is a builder and creator. He’s spend his career leading technology projects across a wide variety of industries and technologies. He’s worked with a homeland security consulting firm helping first responder agencies and NGOs modernize situational awareness and resource geo-mapping tools. Helped a hotel refactor their backend customer service tools to improve guest response times and customer satisfaction. As well as helping operate and maintain financial compliance within a billing and CRM system for the cable industry. In 2010, David joined NBA Digital, the joint venture between the National Basketball Association and Turner Sports. He spent 6 years running the product and program management for the team that oversaw the publishing tools for the 30 NBA team sites and backend services. In 2017 he transitioned to oversee the strategic and tactical implementation of emerging and developing platforms and products for the NBA. His areas of focus have included Virtual Reality / Mixed Reality / Augmented Reality products and promotions, off-platform content distribution and aggregation product integrations, as well as running the digital assistant and voice navigation strategy and product implementation. David holds a bachelors degree in Sociology from the University of Georgia in Athens, where he graduated with honors.